Rent control was one of the most contentious local measures on the ballot this year, but both cities on the Peninsula struck the measures down by a wide margin Tuesday. Measure R in Burlingame and Measure Q in San Mateo drew proponents for and against the proposals out to protest up until Election Day. However, when the final results came in, 67 percent of Burlingame residents and 60 percent of voters in San Mateo had voted "no" to the measures. Pro Measure Q campaigners said it was the largest grassroots effort in the history of San Mateo and attributed its loss to a million dollar opposition budget. "We hope that you will join us as we move forward and keep organizing for the right to a home and a voice in our democratic system," Yes on Q campaigners wrote Wednesday. 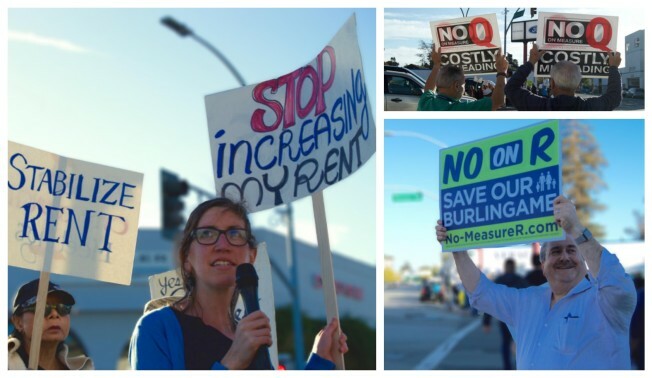 All members of the Burlingame City Council had previously encouraged its constituents to vote "no" on Measure R.
"The unintended consequences of these extensive rules, costs and bureaucracy could be to reduce housing stock as owners remove rental units," the Council wrote in a letter signed by all six members in August. Both Pacifica Measures 'N' and 'M' regarding a bond to pay for a new library and a residential development at the Rockaway Quarry failed as did Daly City's parcel tax, which proposed adding $162 in taxes annually for each property unit toward funding police and fire personnel services. All other local measures passed including an extension of the San Mateo County sales tax and elimination of requirements to maintain San Mateo city fire services. There was also a widespread show of support for the four parcel taxes toward funding local school districts. Bayshore Elementary School District, Burlingame School District, Redwood City School District and Jefferson Elementary School District all received a "yes" vote in the county.